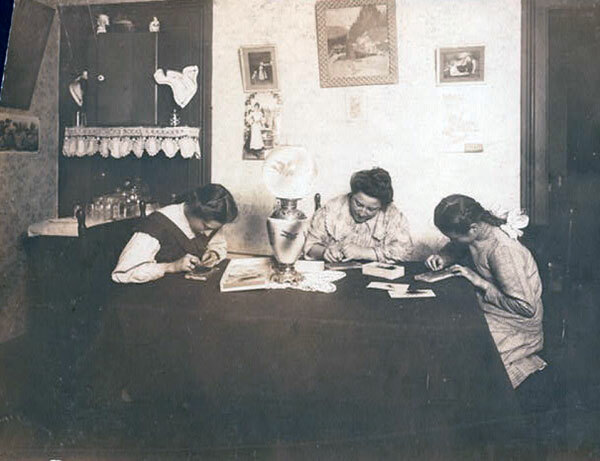 My ancestors, Catherine Furst Schwartzmeier Lindemann, her daughters, Minnie Lindemann Goehle and Katherine Lindemann Beyerkohler Van Loo, Peter Goehle, the Walshes and the Langans lived in tenement apartments in Manhattan. 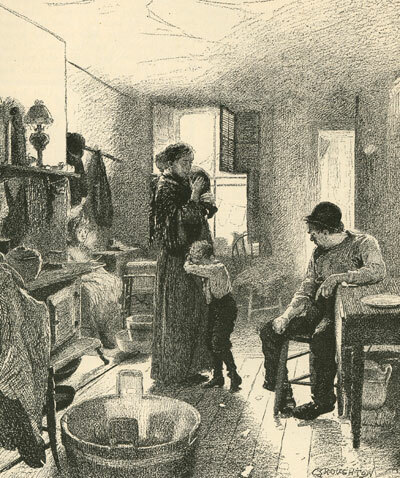 The Lindemanns, Goehles and extended families lived on the Lower East Side which was a notorious tenement district. The word tenement conjures up images of extreme poverty. However the original meaning of the word was to indicate any type of permanent property held by one person and generally rented to another. The word evolved into a description of a large crowded apartment building especially in the poorer more squalid sections of a city. A overwhelming majority of immigrants spent some years in tenements before moving on. 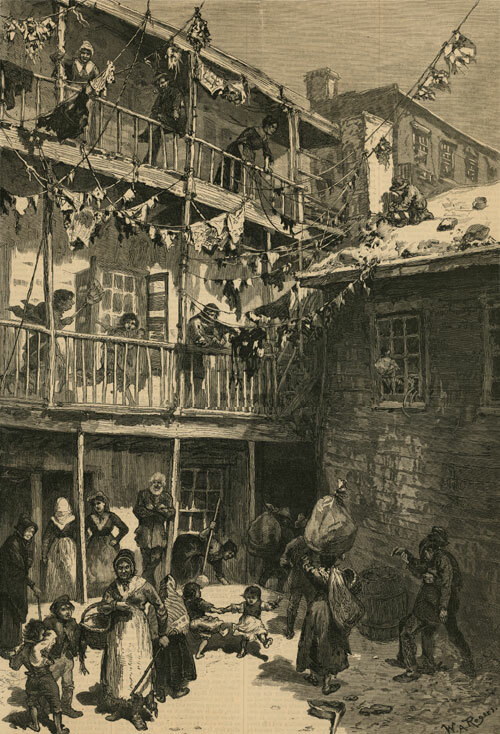 While all tenements before central heating and air conditioning were cold in the winter and roasting hot in the summer not all tenements contained the dirty horrible living conditions with high death rates as portrayed by some of the social reformers. The reformers were, in fact, depicting the worst scenarios, as reformers often do in presenting their case. While horrible conditions did occurred in the tenements there was frequently quite significant prejudices on the part of the social commentators. Many of them, for instance, were temperance advocates who frowned on the German-American's love of his larger and the Irishman's love of his whiskey. There was a frequent lack of understanding of the culture of the most recently arrived Americans. Images of the tenements show chimneys. They generally had a wood or coal burning fireplace/stove in the kitchen. Life in the tenements was hard. Heating and cooking were done by wood or coal burning stoves. Early tenements had very dark hallways as lighting was only from a sky light and/or glass transoms in apartment doors. 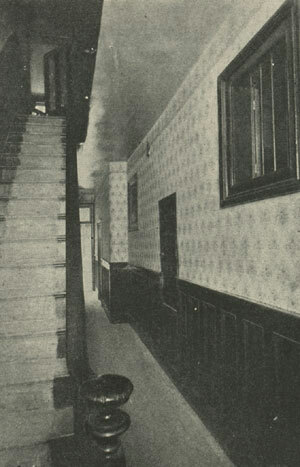 Even the advent of the air shaft next to the stairway did not substantially increase the light and air in the tenement hallways. It wasn't until the Tenement act of 1901 that lighting was required in halls. Gas lighting was initially installed but electric lighting followed quickly behind. 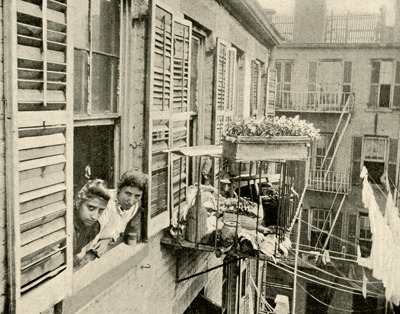 Structurally New York City tenements were generally of two types: - smaller houses of three or four floors that may have originally been one family and were converted into three or four family dwellings - larger buildings constructed as tenements that were typically five or six floors with four families to a floor. In the oldest and poorest tenements water had to be obtained from an outside pump, frequently frozen in winter. The privy was in the back yard. 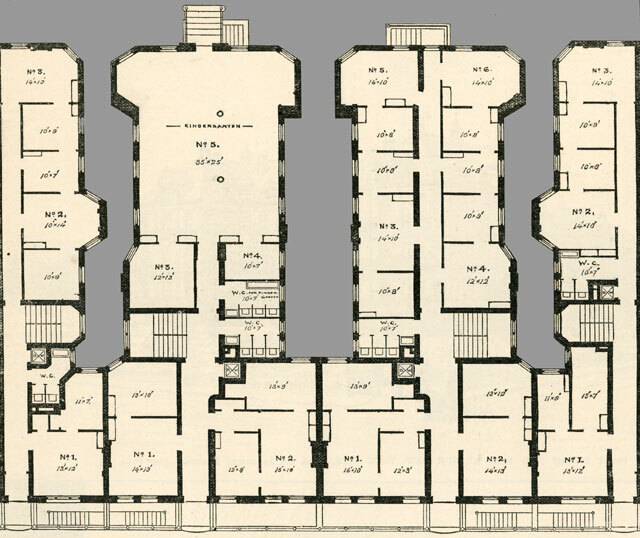 Later buildings generally had a sink and "water closet" in the hall on each floor. 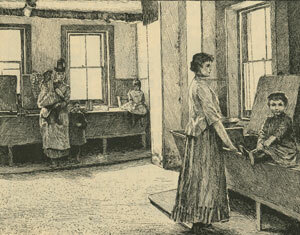 Newer and better class tenements had sinks in the kitchen. They were all "cold water". Water for washing dishes and clothes and for taking baths was heated on the stove. It should be pointed out that the water heater did not come into fashion in the US until after 1889. Wealthier people had servants to heat their water. 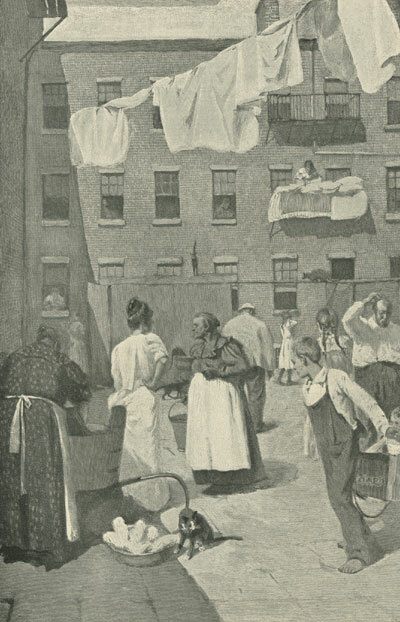 Many of the larger tenements had a housekeeper, often a widow, who received free rent in exchange for maintaining and cleaning the halls stairs and sweeping the sidewalk in fount of the building. As a result many of these larger tenements were remarkably clean. 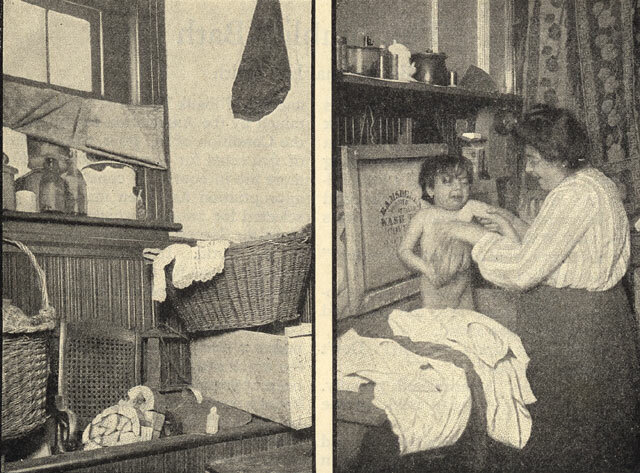 While most tenements were crowded, the majority of tenement apartments were as clean as soap and elbow grease could make them. Many of the tenements built between 1879 and 1901 were very attractive buildings. The brick facades were often decorated with elaborate tin moldings, terracotta inserts, and a network of beautiful wrought iron fire escapes. I am constantly amazed, while walking on the Lower East Side, how pretty some of the old buildings are. 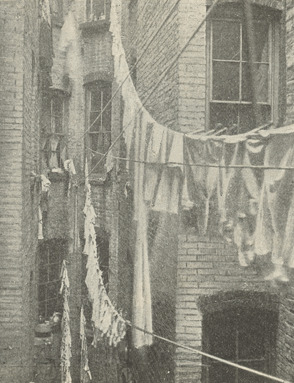 A typical tenement image is of multiple lines of laundry flapping merrily in the breeze - which is both a pleasant sight in and of itself and an indication of the industry and cleanliness of the inhabitants. 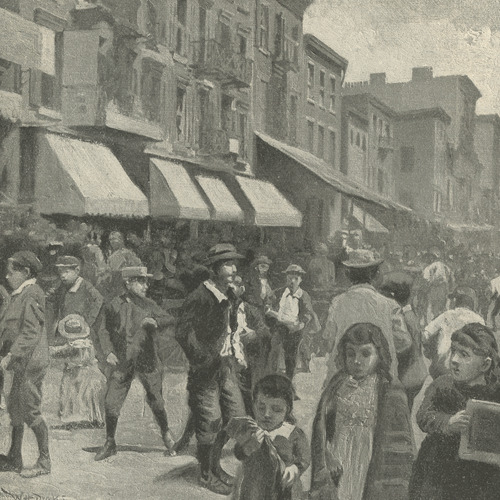 While some neighborhoods were comprised of a heavy percentage of a given ethnic group most tenements contained a wide variety of nationalities and the smells (good and bad) of the diverse cuisines filled the air. What made a tenement a "tenement" was the location and how recently the immigrants had arrived. 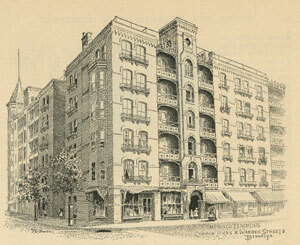 Similar size apartments in better neighborhoods were called "flats". The cheapest apartments were in the attic (more stairs to climb). A vast majority of families lived in a four room apartment: - kitchen, two bedrooms and a parlor. In large families the kitchen and parlor might be converted into additional sleeping space at night. 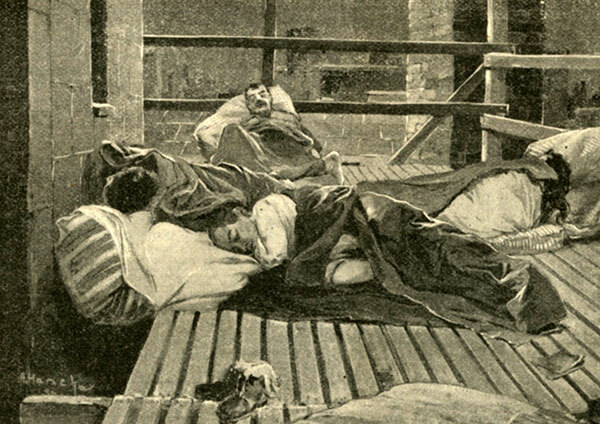 Children slept multiples to a bed - which clearly helped with the heat issue in the winter time. In nicer homes there may have been a carpet on the floor, lace curtains on the window, and pictures on the wall of the parlor. Some even had a piano. 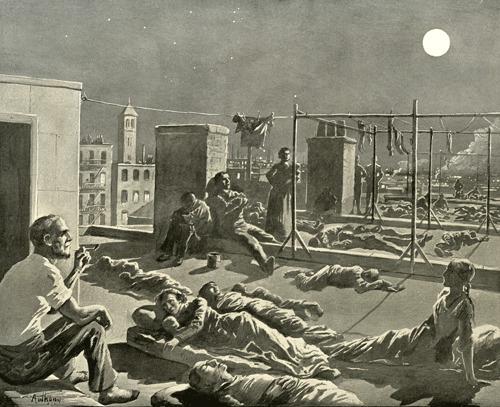 In the summer time, when the heat was very intense, people often slept on the fire escapes and/or roofs. 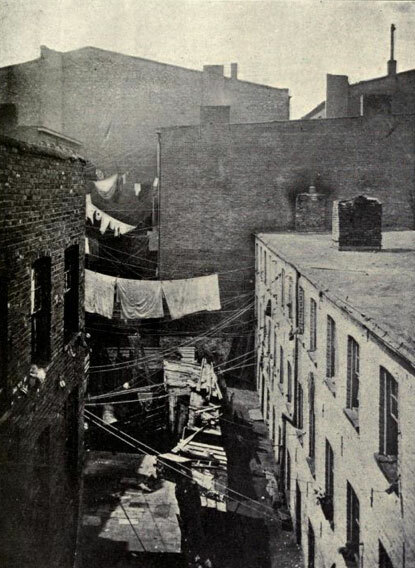 Most tenements in the lower east side were in multi-use neighborhoods and situated close to factories, docks, slaughterhouses, and power stations which provided employment to some in the area. Convenient to get to work but with it meant living with increased air pollution, high noise levers, foul air and obnoxious smells. There were frequent issues with vermin: mice, rats, roaches. For many years pigs roamed the streets. The major means of transport was horse cart and the animals were kept in the neighborhood. Their manure not always removed from the street. Ground or lower floor apartments were darker and noisier but had the advantage of not as many stairs. "Today it is said that nine-tenths of the population of Manhattan Island are dwellers in tenements, and that one-half of them move from one to six times a year." People moved from apartment to apartment with some frequency. As their financial conditions improved they sought out better housing. As it worsened they many have been forced into cheaper quarters. If their position improved substantially they moved to newer areas of the city where the neighborhoods were mainly residential and the apartments buildings had more amenities or to the outer boroughs where there was more greenery. 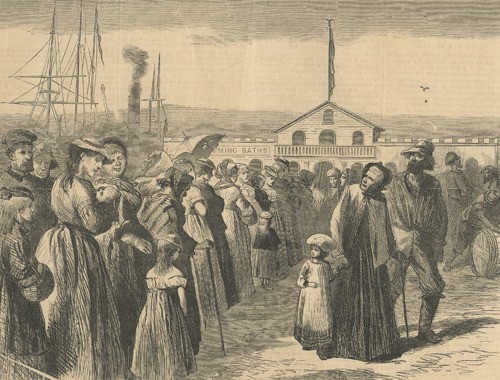 Eventually, many moved to the suburbs or the country on Long Island, upstate New York or New Jersey - and were replaced in the city apartments with the latest immigrant population. 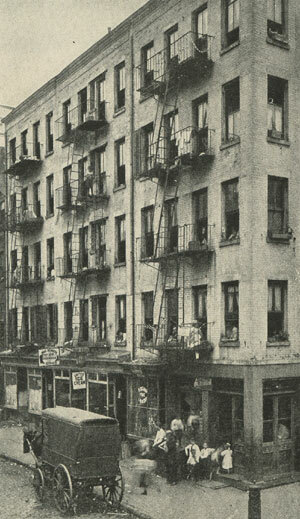 See 88 - 90 Sheriff Street now or at the bottom of the page for a study of one infamous tenement in New York. Note: My focus is on the German and Irish immigrants because my ancestors were German and Irish. I had not paid any real attention to the Italian and Jewish immigrants until I started researching some churches in the Lower East Side. Some of the "missionaries" in these churches seem appallingly prejudice and very unChristian in their outlook. The bigotry and ignorance of some of our foreigners surpasses belief. During the past summer the Polish Jews in New York have been intensely excited because they believe that Christian missionaries seek to brand their children with the sign of the cross." 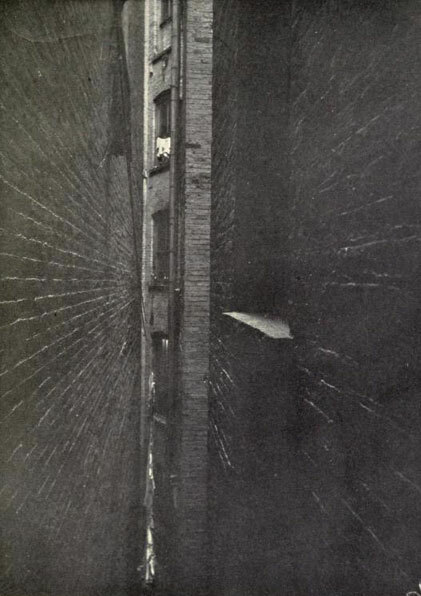 The following images show a range conditions in the New York city tenement houses. The sign above the shelf says: "HOME SWEET HOME"
The already crowded condition are acerbated by the need to hang laundry up to dry indoors. This must have been a common occurrence in stretches of wet weather, particularly if there was illness in the house. Space was at a minimum - consequently furnishings were at a minimum. Notice, however, in this and the next image that there are lace curtains on the window and some attempts at decoration. 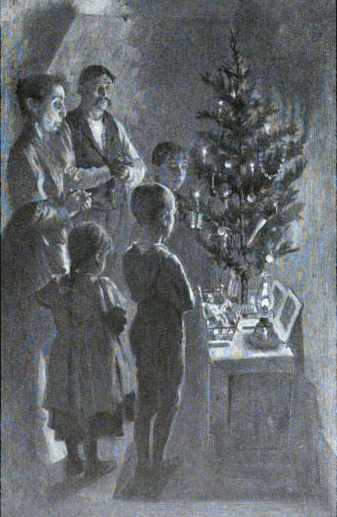 The Christmas tree at the edge of the picture could indicate a German American family. The older woman helping to dress the boy could be a servant or a grandmother. It was very common for multiple generations to live together. Also, even some of the less well-to-do had servants. * Alcoholism was clearly an issue for many of the working class poor. However, then as now, it was not necessarily a class exclusive problem. Yet there is the impression from several of the articles of the time that alcoholism was a matter of class and that the lower classes suffered more from such problems. Most of the articles written about the tenements and slums were written by social reformers many of them with religious leanings that were anti alcohol. There are subtle indications of prejudice in the civil records. I have seen numerous death certificates which list the dwelling as "tenement" and a contributing cause of death as "alcoholism" (especially if the deceased was Irish) - regardless of the actual cause of death. While alcoholism may have been a shortened many lives I can't help but feel that it was frequently a prejudiced reaction. While I have not looked at as many death certificates of the wealthy I would bet that there is never such a distinction regardless of how much or how often the deceased drank. Notice the window in the hall which gives some light into the living quarters which were otherwise too deep into the building to receive any light. Conversely, at night the widow might give some light from the apartment to the hall. 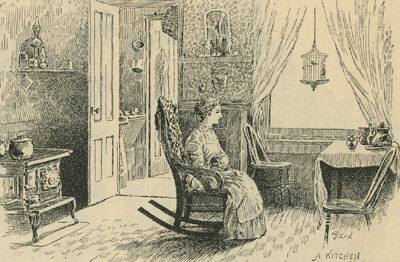 In addition to showing another interior, this image also depicts the home wake. 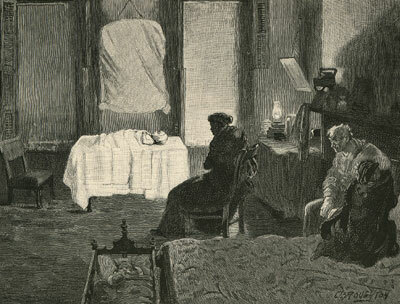 Rich and poor alike had home wakes - the funeral home did not exist before the 20th century. 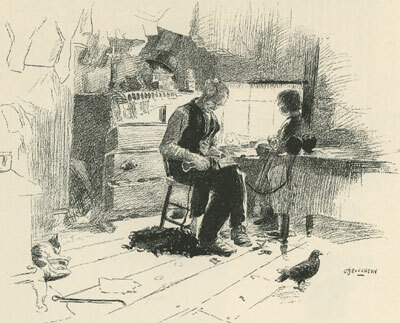 The bird and the cat are tender reminders that many of New York City's immigrants came from rural setting in their home country and liked a bit of nature. My maternal great great grandmother, Nappie Byrne Langan, who was born in rural Mayo and immigrated to New York City in 1892 is said to have feed the mice in her apartment because they reminded her of the field mice back in Ireland. 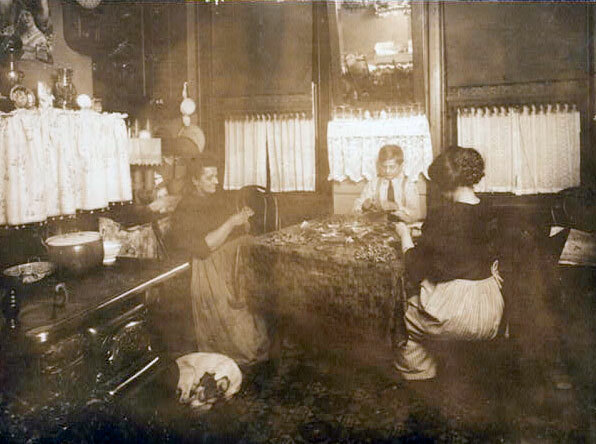 A kitchen in an improved tenement. Notice the bare feet of the women. 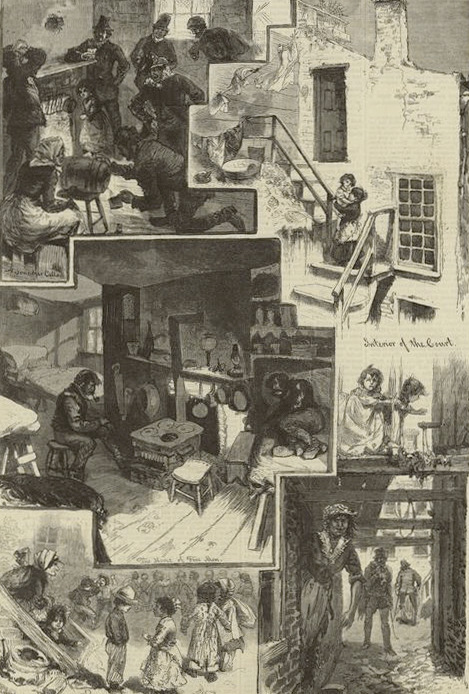 These images depict a variety of financial circumstances in tenement dwellings. The following three images were taken to illustrate the evils of child labor. But they also reveal other aspects of immigrant life such as attempts at niceties like lace curtains and lace bureau scarves, framed pictures and/or mirrors, family photos, and nicknacks of various sorts. Notice the dog asleep in the first image. The issue of child labor is complicated. From time immemorial working-class children have learned their trades from helping their parents or being apprenticed to a master tradesman. The roof was a place to escape the heat of the summer night. 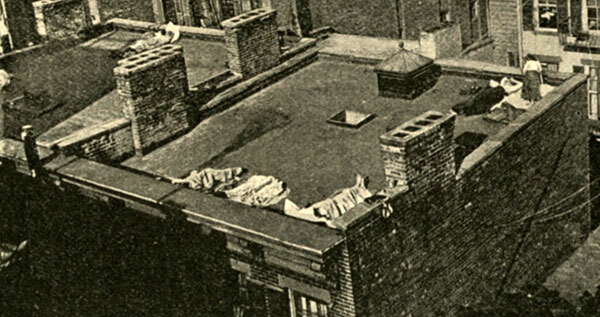 This image illustrates not only the concept of sleeping on the roof but that of sharing a bed. 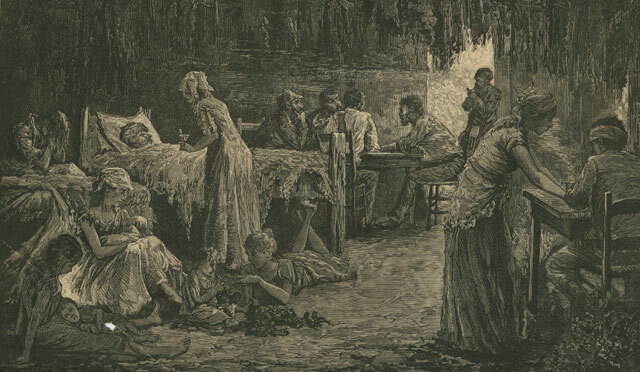 Family beds were a very common practice throughout the world and practiced by all social levels until relatively recently. Every Inch of Space Used to Squeeze in Buildings. 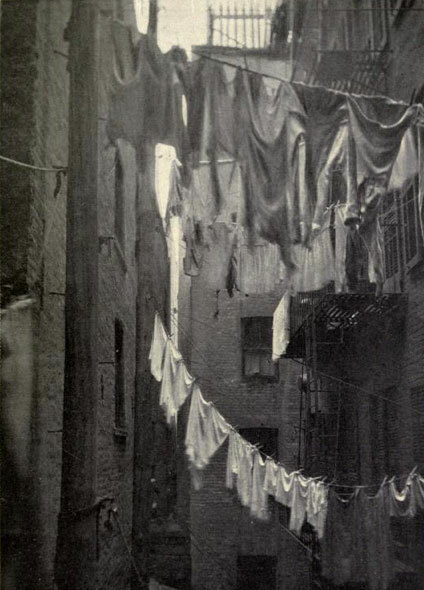 Many tenement buildings were dark and airless. The following map and image show just how closely the buildings were packed together. 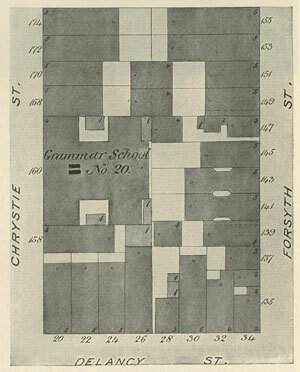 This plan of the Chrystie Street School and neighborhood shows the form of the tenement buildings. The grey is the building and the lighter areas indicate yards. The lots were 100 feet deep by 25 feet wide. This image shows pre 1879 buildings (with no air shafts) and post 1879 buildings (with air shafts). Notice that #s 20, 22, 24 and 26 Delancy Street are solid blocks of buildings while the air shafts (the white shapes) can be seen at # 141, 143 and 145 Forsyth St.
Notice how small most of the "yards" are. Surrounded by so many tall buildings they were general dark. 168 and 170 Chrystie and 149 and 151 Forsyth have rear tenements. That is, a front building and a back building with a yard in between. Rear tenements had the worst reputations. The numbers 1, 2, 3, 4, 5 and 6 indicate the number of stories to a given building. One foot wide by six feet long, the sole source of light and air for sixteen rooms where thirty or forty people sleep." Good Tenements For A Million People, the Story Of New York's Successful Fight For Better Housing by Emily Wayland Dinwiddie circa 1909 publication unknown, collection of Maggie Land Blanck. 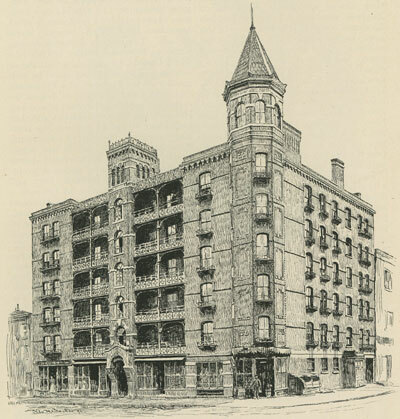 For twenty years the "dumb-bell" was practically the only type of tenement building constructed on Manhattan Island. There are in existence to-day more than ten thousand of these homes. They are ordinarily five, six, or seven stories high. On the entrance-floor are frequently two shops with three room apartments in the back. In the centre is a long, dark, very narrow entrance-hall. On the upper stories are four families to a floor. Here on each side of every hall are seven rooms, extending back from the street to the yard. The families in the front usually have four rooms each; families in the rear have three. A front apartment has one room opening on the street; back of this are three rooms with windows on an air-shaft twenty-eight inches wide. 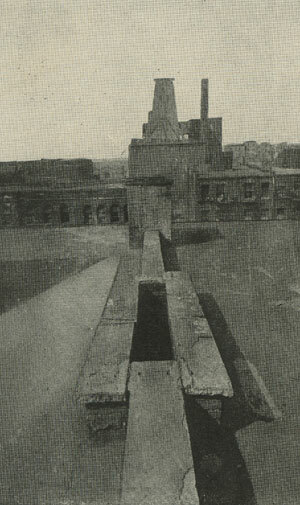 The rear apartments have one room opening on a yard ten feet deep, and two rooms on the twenty-eight-inch -wide air shaft. Needless to say, the air shaft rooms, front and back are dark except on the top floor. The shafts are "stagnant wells of foul air", "conveyers of noise, oder, and disease, and when fire breaks out serve as inflammable flues." 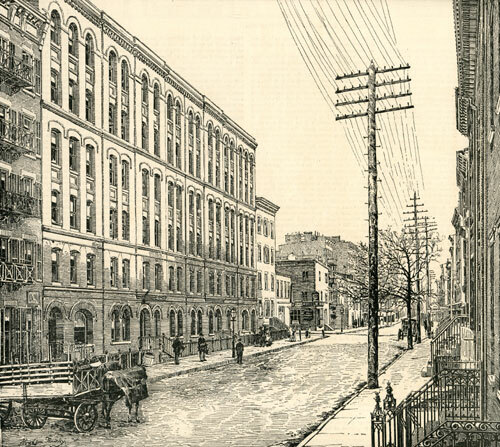 In 1901 the "New Law" was passed that required more air and light in newly constructed buildings. An extreme example of the poorer class of tenement house. Clothes in tatters, laundry in shreds, men idling about, children running wild, mothers beating their children, a obvious drunk - and yet - a man helping the drunk, two little children dancing merrily, a woman with a broom who appears to be cleaning up, and the industrious rag pickers carrying there wares. Gotham Court was built in 1850 to rescue the poor and unfortunate from the evils of the older tenements. 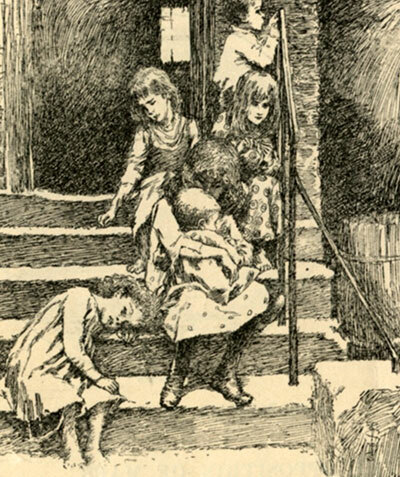 However, only 10 years after it was completed Jacob Riis reported that 61 of 138 children born there in a three year period had died before the age of one. The building was torn down in 1895. The Harper's article says there was a frontage of 30 feet on the street. The building was 300 feet deep and "is divided practically into two buildings by a partition wall extending all the way from front to rear". One division had a court on the west side and the other had a court on the east side. These "courts were", in fact, alleys. 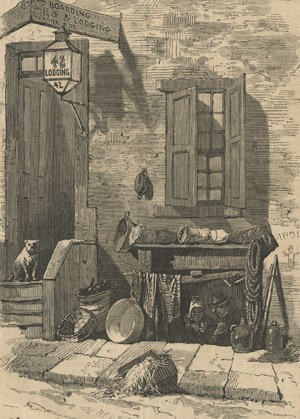 The ground floor apartments visited by the reporter were "small, dark and dirty" "at noon on a cloudy day" were "as dark as early evening elsewhere". The upper floors were brighter but just as small and dirty. Seventy out of every 100 deaths in the city occurred in tenements. Childhood illness and death were rampant. Dr. STEPEHN SMITH, an authority on this question, says: "One-half the deaths of the city are of children under the age of five years of age. 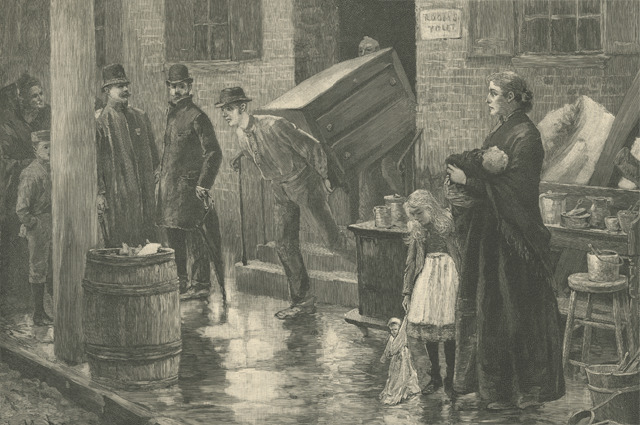 Since 1872 the deaths in New York have been 32,647 of whom 16,188 were under the age of five years. The mortality is not the sum total of the damage. Where there is one death here are seventy-five cases of sickness"
The worst months were July and August with over half the number dying during those months. Half of the died form "foul air diseases". Notice the bird house and the cat. "Here Uncle Tom's Cabin was first presented in New York, and many a favorite actor played his part. The sky-light still remains, and some of the machinery, but there is little else to remind one of the old play-house." 42 Cherry Street is between Catherine and Market Streets between the Brooklyn Bridge and Manhattan Bridge. "This is one of the oldest houses in New York, having been built by a Dutch family nearly two hundred years ago. It was made from Holland brick, so well cemented together that a year ago, when the front was being strengthened, the workmen had the greatest difficulty in tearing down a portion of the front of it so it could be removed." " Two months ago the occupants of the house remarked that something was wrong. 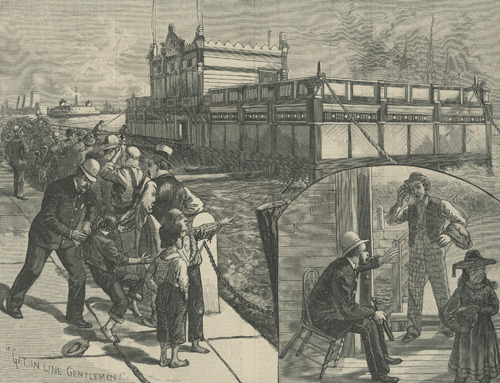 When trains passed on the elevated railroad, or heavy wagons went along Grand Street of South Fifth Avenue, it vibrated to an extraordinary degree. Furniture got out of place, articles left on tables fell from them, window casings bulged, and doors could not be closed or opened. Six weeks ago, at night, several persons in the house were startled by a crack and a jar, and discovered a yawning rent in the party wall. One of the tenants spoke to the landlord and insisted that a complaint be made to the proper authorities, and that the building should be repaired." No repairs were made and the tenants were not ordered out. The article does not mention loss of live and property. The image does show several men carrying a stretcher with what appears to be a body covered with a sheet. An example of the poorer class of tenement house. Social reformers did put pressure on the city and city housing laws were passed that greatly improved the lot of the tenement dweller. This tenement apartment at 340, 342 and 344 Cherry Street was erected by the Tenement-house Building Company a group of "public spirited and philanthropic" citizens to try and address some of the worst issues of tenement housing. 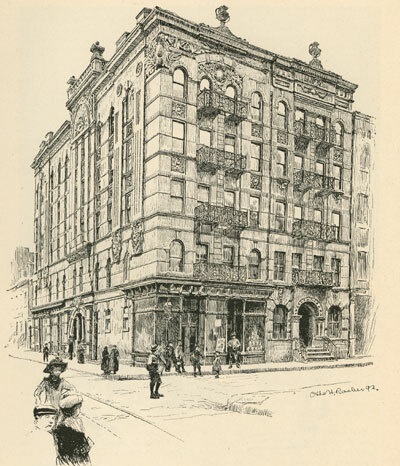 It opened in 1888 and boasted a laundry room and bath rooms (rooms with bath tubs) on the lower level as well as a kindergarden on the first floor. Each floor contained a WC (water closet) that was shared by two or more families. All rooms had windows, none were smaller than 10 feet by 8 feet and each apartment contained at least one room that was at least 12 feet by 12 feet. There was no dark narrow hallway, all having widows and gas light at night. Some apartments had running water. Rents were from $6 to $15 per month. This area of Cherry Street no longer exists. It became the site of the first New York City superproject, the Vladeck Houses - 24 six-story buildings which were started in 1930 and completed in 1941. Improved Tenement corner of Hicks and Warren Streets, Brooklyn. Another example of well designed tenement housing. This building still stands. Housing laws did improve the lives of tenement dwellers and some wealthy real estate investors put their money in tenement housing. Where the poor save a large percent of their fuel bill by purchasing their coal by the ton collectively instead of individually by the basket. It is on East Thirty-first Street, New York. This building had a "Sun Parlor" on the roof. "325-329 Water Street, New York. 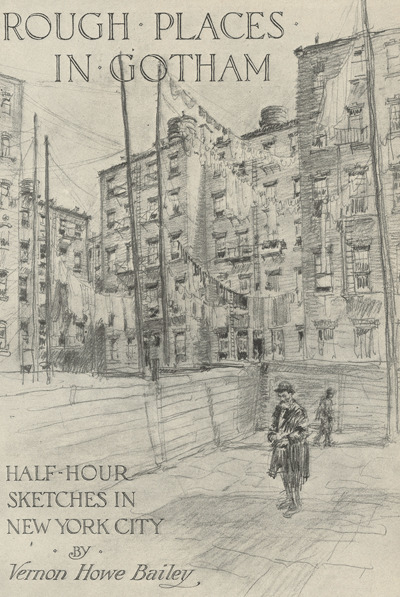 New York City - The recent "heated term" and its effect upon the population of the tenement districts A night scene on the East Side - from sketch by a staff artist. Frank Leslie's illustrated newspaper, Aug. 12, 1882, p. 393. There are a lot of reports in books and the popular press about the extremely crowded conditions in the tenements. "Those who live in the country, where there is abundant room for all, can scarcely conceive of 500 people living in one house. And yet more than that number of residents were counted some time ago in a house two doors from Camp Memorial Church." 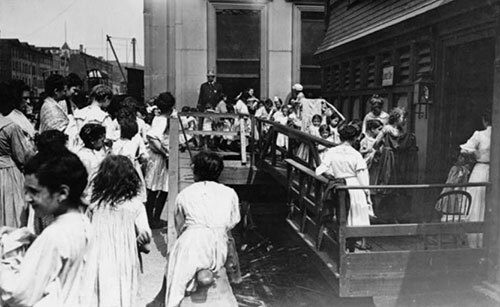 There is no question that many immigrant families were large and tenement conditions were crowded. However, there also may have been some overstating by reform minded individuals. 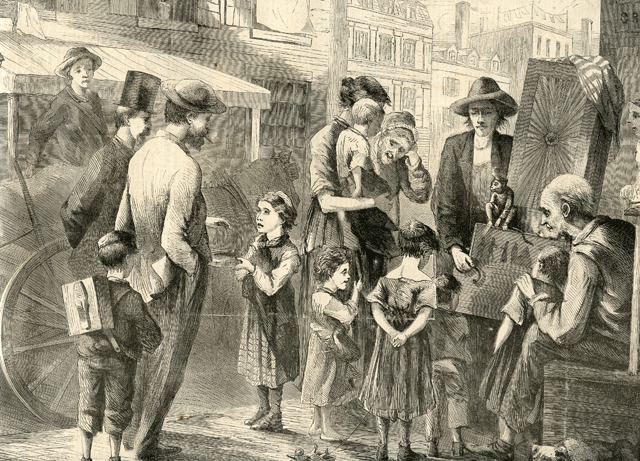 "The Census - An Enumerator collecting statistics in the German District on the East Side, New York City"
"The Enemies of the Working Girl"
The title of the image makes reference to the numbers of families who did piece work at night and/or or using underage children as laborers. "Working girls" of the time were trying to get improved working conditions and wages through unions and strikes. Based on the tools lying on the floor this new father was a carpenter. 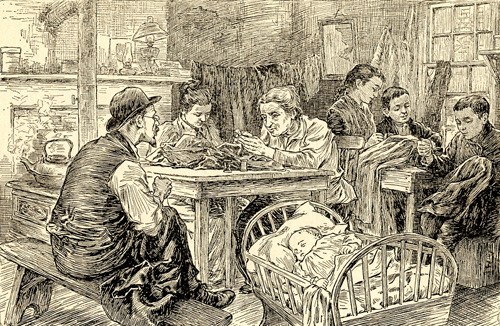 The old woman holding the baby is a possible reference to multi-generations living together as was the case of the Goehle family when they were on Sheriff Street in 1890. There was and economic panic in 1873 which resulted in a four year depression. The economy began to improve in 1878. 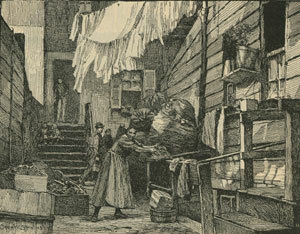 Eviction was a common fact of a lifestyle that was often hand to mouth. An illness or death in the family could result in a significant reduction in income and an inability to pay the rent. 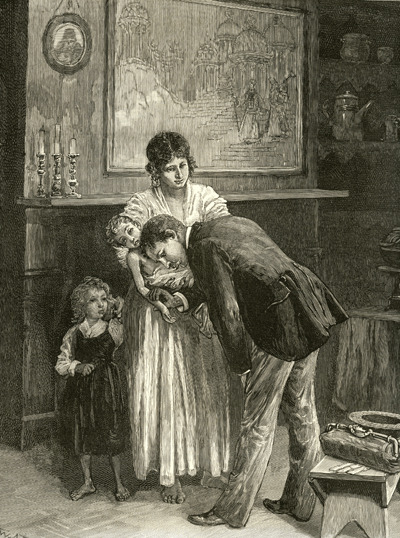 Widows with small children were particularly susceptible to eviction. Assistance often came in the form of family friends and neighbors taking up a collection to tide the family over.
" 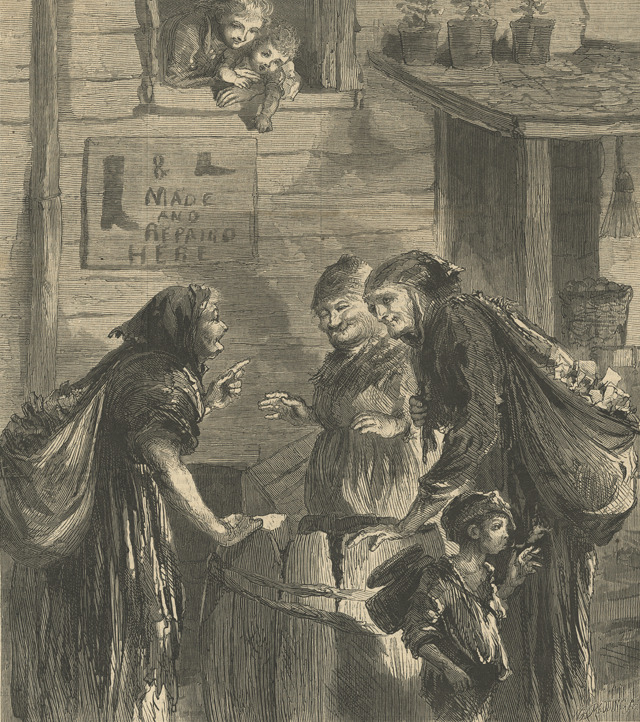 Our illustration on page 1140 presents one of the many sorrowful incidents of the life of the poor during hard times like the present, when work is scarce, and every penny that can be earned is required to buy the fuel and food necessary to keep cold and hunger from the door. Hundreds and thousands in great cities like New York, unable to find steady employment, are at the present time suffering for want of common necessaries of life. 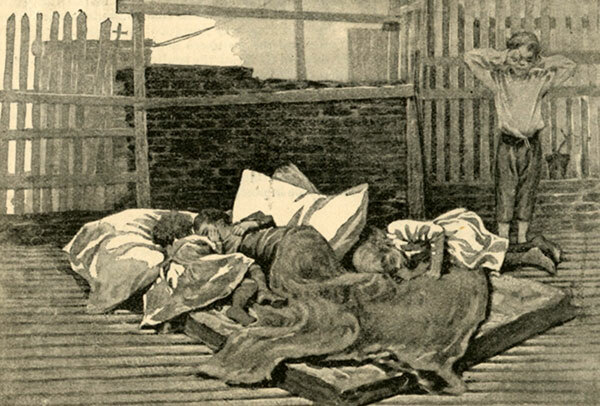 The coal, the food, the clothing, without which they would perish, consume their chance and scanty earnings, and the dreaded rent-day to often finds them without the means to prevent their being turned out into the streets, or forced to take refuge in some wretched tenement garrett or cellar, wholly unfit for human beings to life in. Fortunate are the poor who have compassionate landlords willing to wait for their rent until better times come round again. The tools on the floor indicated that this father was a carpenter. There was a financial "panic" in the fall of 1873. The Stock Market closed for ten days starting on September 20. It took years for the economy to recover. Construction slowed, wages were cut and real estate values fell. This image seem to portray a multi-generational family. There was no workman's compensation. If the breadwinner was hurt, he (or she) would be out of work. 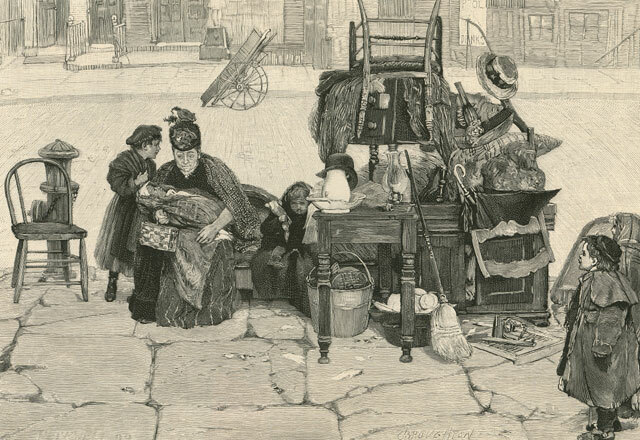 The landlady has "turned out" this father, mother and their five children and all their possessions. This poor lady, her baby and two small children are out on the streets with their meager possessions. Bathing, even among the upper classes, was not popular before the late 1800s. 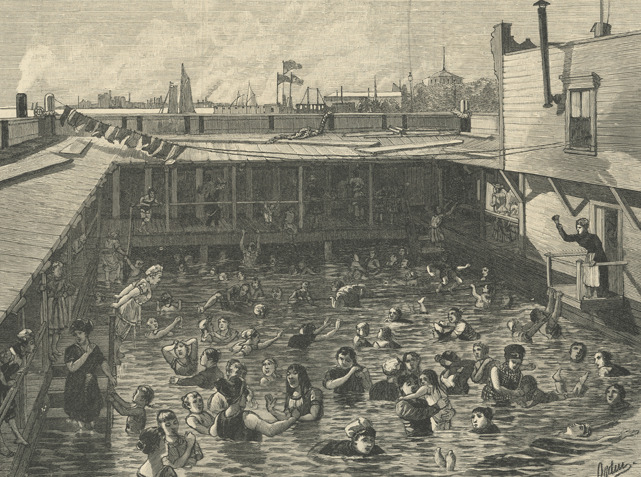 As health authorities began to become aware of the need for public hygiene, bathing was encouraged for all classes and in 1895 state legislature mandated the availability of public baths in cities of 50,000 or more. 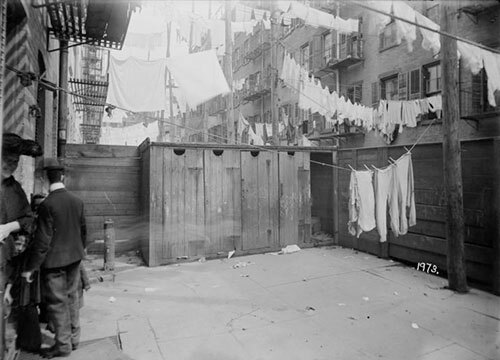 A majority of tenements in the 1890s did not have indoor plumbing. Those apartments with running water had only cold. In some tenements the only water came from a faucet in an unlit hall way and some tenements had only one facet per building, supplying up to fifty tenants. Bathroom, when available, where most likely no more than one per floor and shared by several tenants. The common bath frequently did not include a tub or shower. 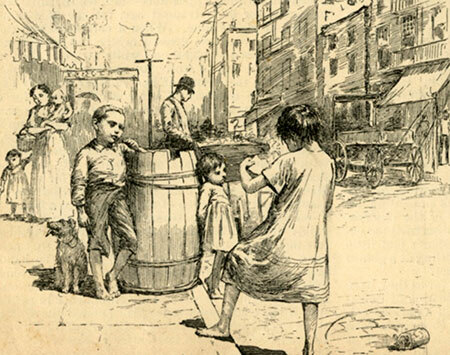 In 1905, there were areas in New York where 36 baths were shared by at least 2,500 families and in some blocks there are as many as 800 families and no bath at all. 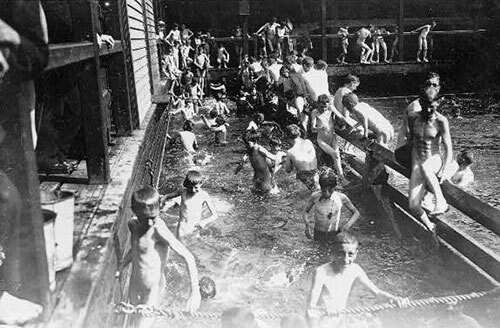 Tenement bathing usually took place in the kitchen in a dish pan, the sink, or a portable tub. To make bathing available to the tenement dwellers the city build public baths. 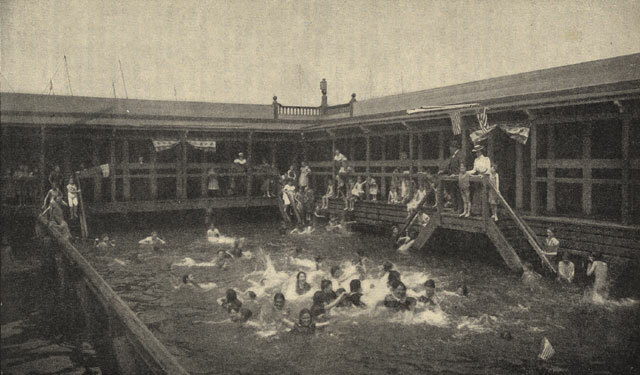 The first public bath in Manhattan was opened on 326 Rivington Street in 1902 and in five months accommodated 224,876 bathers, about three times as many men as women. In 1905 there were 7 public baths in the Manhattan, five were under municipal management and were absolutely free, the other two charged a minimum fee for soap and a towel. There were four more baths under construction and one in the planning stage. In addition there were floating baths along the river. 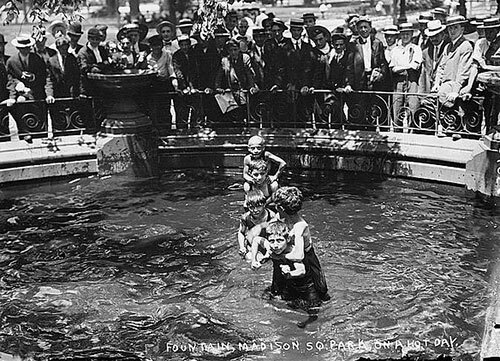 These were as much swimming pools as places to wash, thus combining recreation and public hygiene. 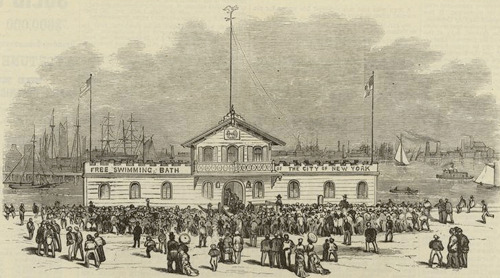 The floating baths were a kind of wooden wharf enclosing a swimming pool that allowed the river water to flow through. 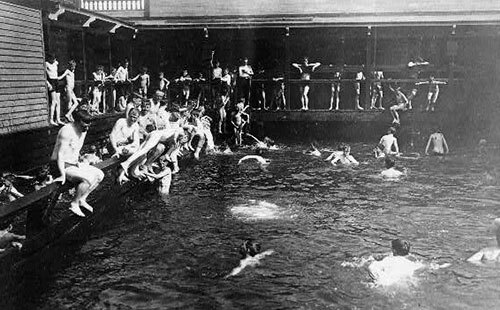 In 1902 the floating baths were used by 5 or 6 million in the summer season. 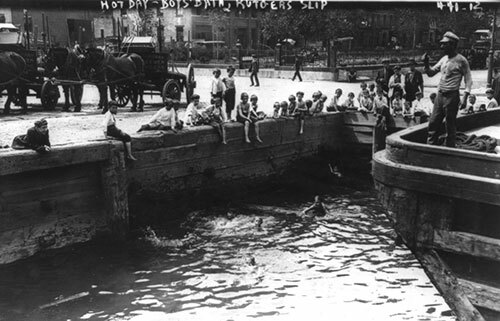 Some young men braved the dangers of the rivers by jumping off the docks to take a summer swim. While the article includes this photo, very little was said about the use of showers in public schools. 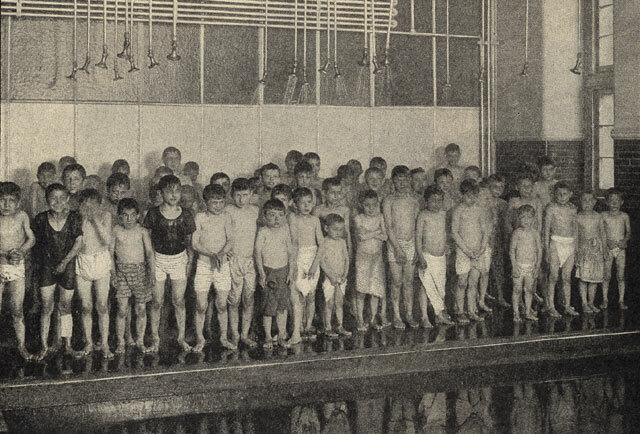 The children do appear to be standing in front of a swimming pool. 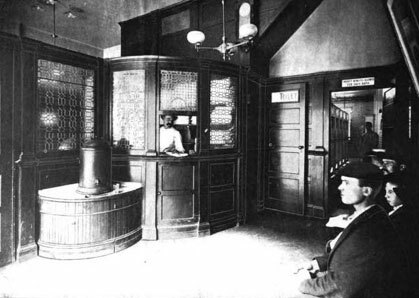 Waiting room in the Public Baths 1899-1900. 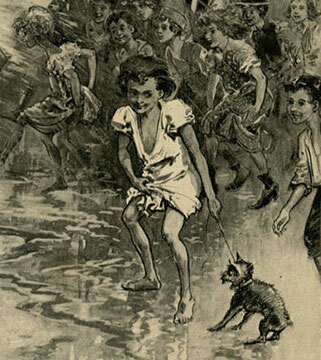 While not "officially" a bath, boys had the advantage of cooling off (and maybe getting a little clean) by jumping off any pier, into any river or fountain. 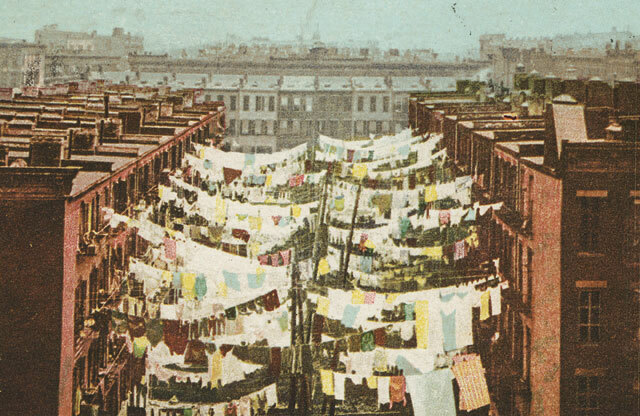 With all the talk about how dirty the tenement district was it is very impressive how many images of the tenements show laundry on the line - outside if the weather permitted inside if it was inclement. 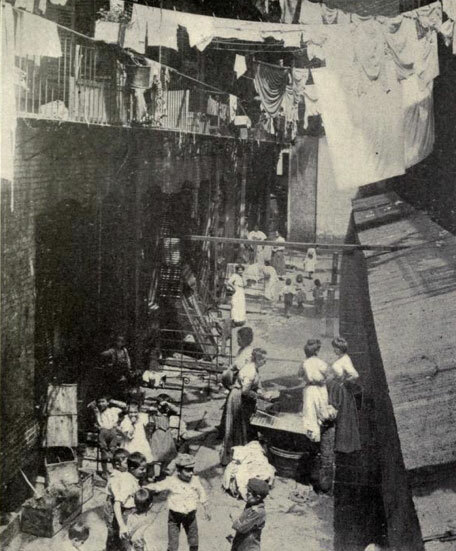 "Washing among the Mulberry Street Tenements"
Yard of a Tenement, New York copyright 1900, posted 1906. (Closed at both ends. Bedooms pich dark; sixty windows open on this air shaft.)" 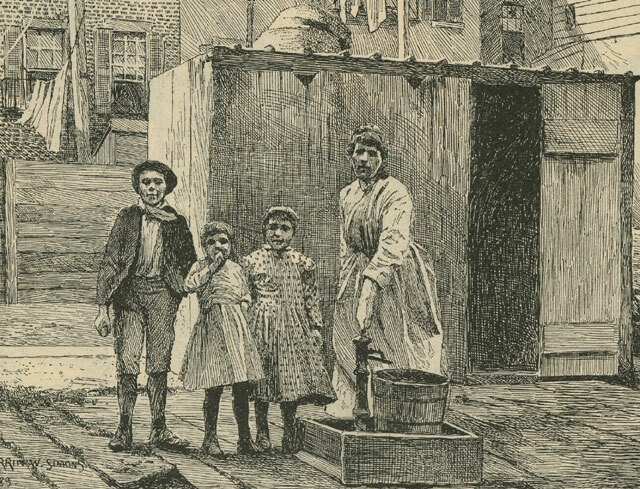 "The Water Supply for Three Ludlow Street Tenement Houses 1890"
While there is a lot of discussion in the literature of the period about washing of persons, washing of clothes, water in court yards and water in apartments, there is almost no mention of toilets (or lack thereof). Other than the occasionally mention of a chamber pot almost nothing is said. 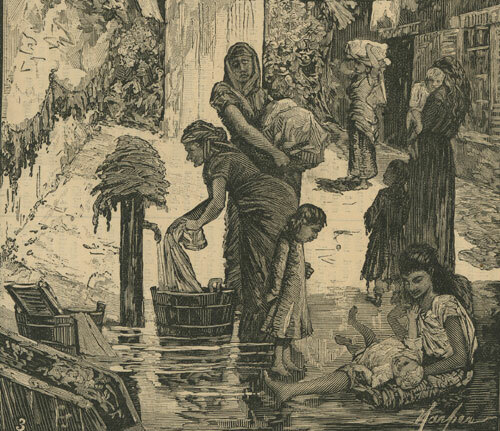 While this image is entitled "the water supply" the toilets in the background may not have been supplied with water. In other words, they may have been old-fashioned pit outhouses (AKA privies). 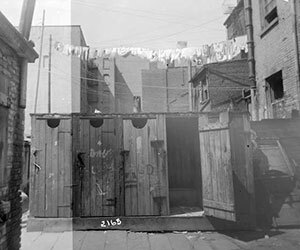 Interestingly a lot of archaeological work has been done on the lives of tenement dwellers in New York as a result of excavating these old privies because people threw or dropped a variety of items in the privy. Unfortunately, the majority of the 850,000 artifacts found at Five Points were housed in the basement of Six World Trade Center which was destroyed on 9/11/01 when the facade of Tower One fell on it. Only 18 articles from the collection survived because they were on loan at the time. So the only remnants are the images on the web site and in some publications. Other outhouses, called school sinks, were rows of cubicles over a concrete vault which was connected to a common waste system. The system was periodically sluiced with water which flushed the wasted into a public sewer line. 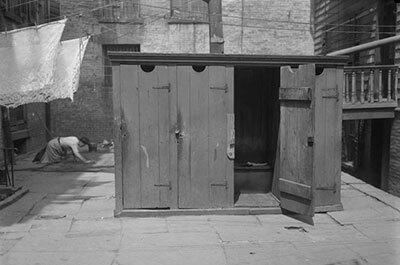 In 1901 the law in New York required 1 indoor toilet for every two apartments. 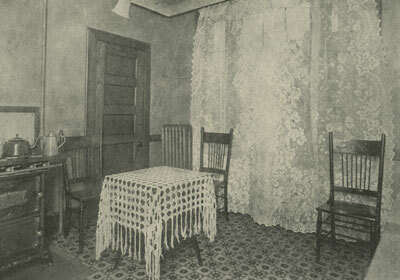 There is a women in the background on her knees scrubbing a rug and there are white lace curtains hanging on the line. Most tenement dwellings did not have refrigeration until the 1930s. In the summer time it was necessary to shop frequently since the food would not keep. "The icebox was invented in 1840 . . . . 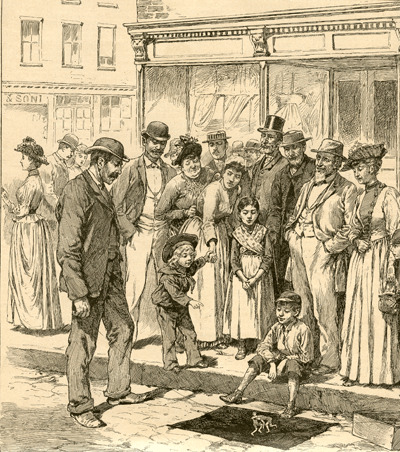 Shortly thereafter, NYC saw the establishment of regular delivery routes for natural ice." . It cost between $.10 and $.25 for a block of ice to be delivered and which might last several days in an ice chest. That cost could rapidly consume a large part of the budget on a regular basis when you consider wages being paid in the late 19th century. 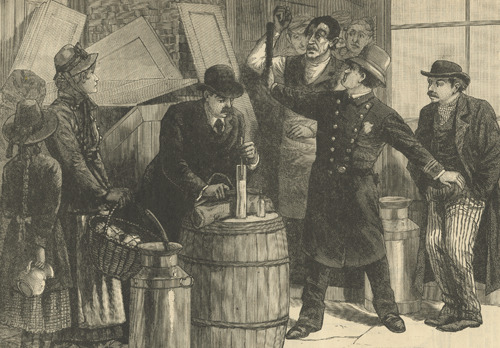 Probably the only people who could afford large quantities of ice on the Lower East Side in the 1890s were those doing well and butchers and fish mongers who could spread the cost among the clientele. Whether most people or any of the Berger children had an iced box is questionable, putting to one side the issue of space. According to the Sears & Roebuck Catalogue from 1897, iceboxes or ice chests ranged in price from approximately $3.00 to $20.00. On average, such a purchase would have represented a month's rent for immigrant families. The cheapest ice chest advertised by Sears & Roebuck in 1897 was made of hardwood, lined with heavy metal throughout, and included a wooden slat rack on the bottom for ice and heavy metal shelves. . However a number did have a small insulated chest or box which as kept on the fire escape. . My impression is that food was bought in the quantities needed and prepared and consumed on a daily basis. To the extent there were cooked left overs they were consumed the next day. 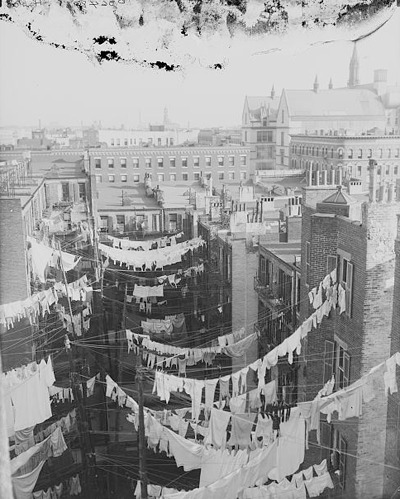 In tenements, meal preparation was a challenge [if the family was poor] that required effort from every member of the family. 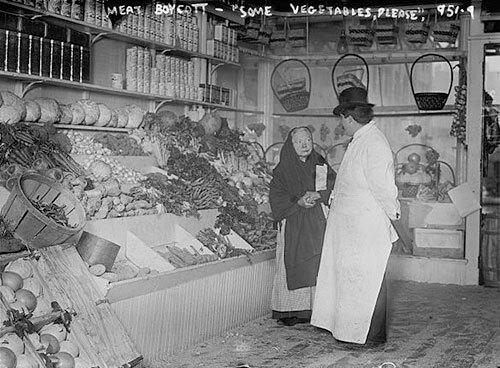 Children scavenged wood for the stove, and mothers stretched every penny, shopping at pushcarts where vendors were willing to sell just half a parsnip for that day's soup or stew. . The following images are also found in other sections of this page and other related pages. I gathered them together to illustrated the fact that people obviously kept pets including cats, dogs, and even apparently a pigeon. Lest we think that only the working poor lived in multi storied multi family dwellings - such buildings were also the home of the wealthy. However, there were some major differences. 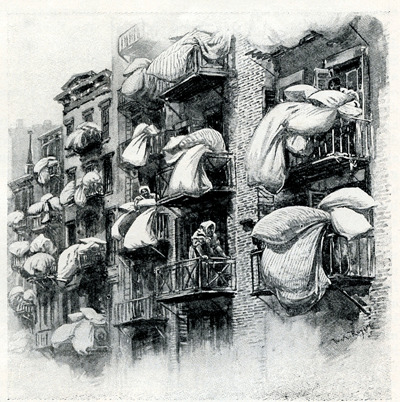 Everett N Blanke in the "Cliff Dwellers of New York" published in Cosmo in 1893 says the distinction between an apartment house and a tenement is "somewhat hazy" until one considers the etymology of the two words. "Tenement" is derived from the Latin verb "ternere" (to hold) and is the name properly given to a building that is designed to hold or to give shelter to the largest possible number of persons, at least possible cast to each individual tenant. "Apartment" however, is an anglicized derivation of another Latin verb, "partare" (to divide), and with equal propriety is applied to a dwelling house, of which the structural and social intent is to separate family from family and to gratify the desire for privacy that every household naturally feels, at the same time reducing the expense of that gratification to a low estimate,....... Economy, there fore, is the purpose of the tenement - comfort that of the apartment." The big difference is clearly in the comforts provided by the "apartment" buildings. 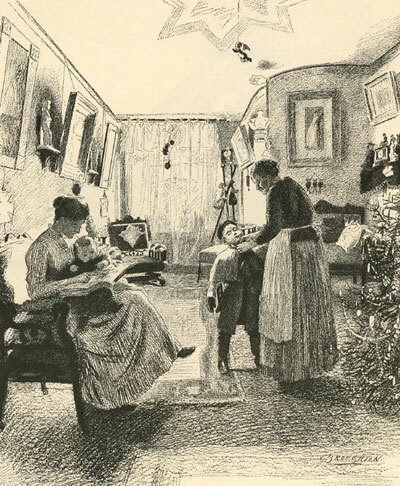 The first "apartment" house, called Stuyvesant, was build in 1870. 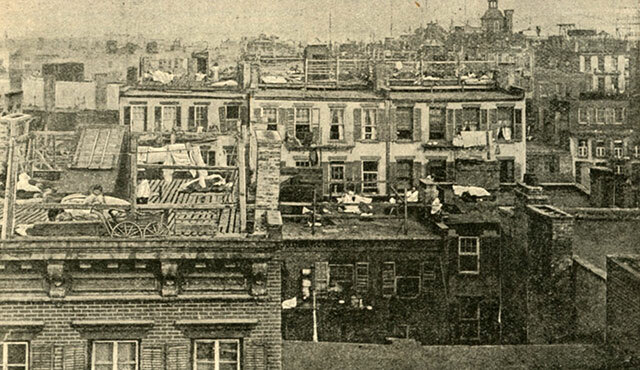 By 1893 New York contained 700 "apartment" houses. Nearly all of them were equipped with "electrical and steam appliances". This included the passenger elevator which made the upper stories of these building more - instead of less desirable - as the top floors of walk up tenements were. The easily accessible top floor was far away from the dust and noise of the street and nearer a cooling summer breeze. However, most of New York's wealthy left the city to spent the summer at their county or beach houses. Eclectic lighting was clean, odorless and constant. Steam heat was controlled by a thermostat enabling a constant temperature. The ordinary apartment consisted of seven to ten spacious rooms generally all on one level. Moreover, the wealthy had servants - maids, butlers, cooks and nursemaids - to take care of those nasty chores for them. Information from"The Cliff-Dwellers of New York" by Everett N Blanke, Cosmo 1893. 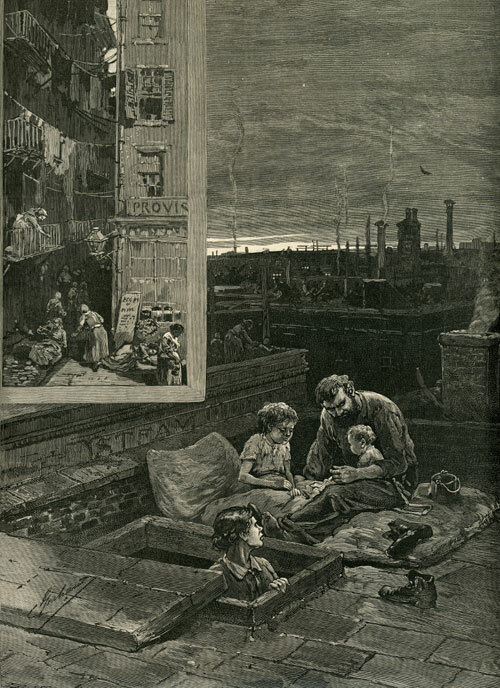 "Life in New York Tenement-Houses as seen by a city missionary" by William T Elsing. 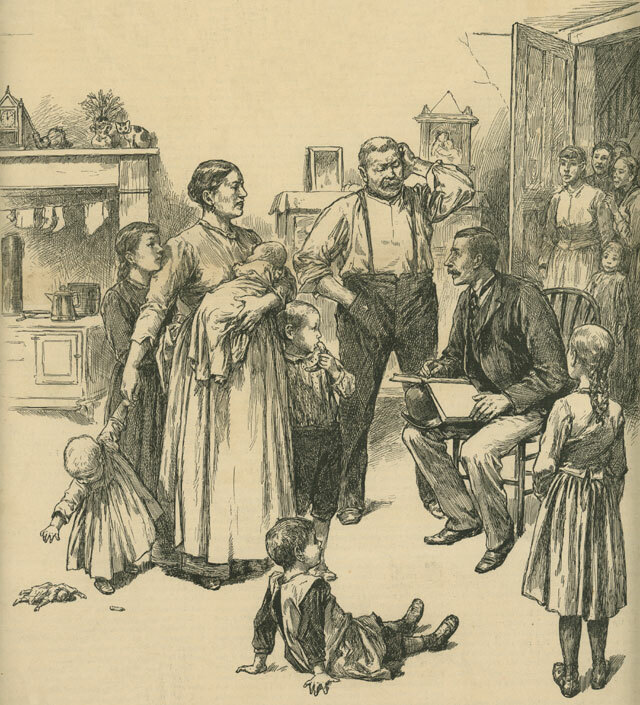 Several images and some information came from an article entitled "Life in New York Tenement-Houses as seen by a city missionary" by William T Elsing. There are numerous venders of historical images and articles who cut up old publication and sell them as individual items. Unfortunately, when I bought this article the name and date of the periodical were missing. I had tentatively dated the article to 1903 because Elsing makes reference to "The first bath was opened last August". 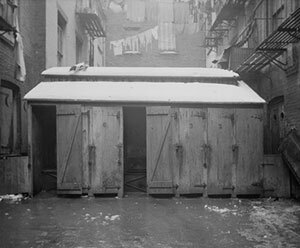 Other sources refer to the first public bath opening in New York City on Rivington Street in 1902. Trying to give an exact date to Elsing's article, I looked on line. I can find several references to an article of exactly the same title attributed to Scribners June 1892. Unfortunately, I was not able to access the actual article. The reference to the baths opening a year before is confusing but I believe that the article I have is that from Scribners June 1892. William T. Elsing was a minister and social reformer whos name is connected in several publications with the well known social reformer, Jacob Riis. William T Elsing was born in 1852 in Holland. He was listed in the 1900 Census in Queens as a preacher with his wife Mary and two sons, Morris, age 17, and Warren, age 14 and a servant. In 1910 he was listed in Ward 19 Brooklyn, as a boarder, married, clergyman city mission, his wife was not listed. In 1920 he was in Manhattan, pastor church, age 69 widowed. As with the William Elsing article this one came undated and the publisher unknown. It does refer to the New York City Tenement House Department report of 1909. Emily Wayland Dinwiddie born 1849 died 1947 was a social worker. The section of the city embraced in the wards we have named is filled with a class of buildings called tenement houses. The law classes all dwellings containing three or more families as tenement houses, but the true tenement house is an institution peculiar to New York. There are about 70,000 buildings in the city used for purposes of business and as dwellings, and of these, 20,000 are tenement houses, containing about 160,000 families, or about 500,000 people. This would give an average population of eight families or twenty persons to each tenement house in the city. In 1867 the number of tenement houses was 18,582. The reader will no doubt suppose that the inmates of these houses are compelled to remain in them because of extreme poverty. This is not the case. 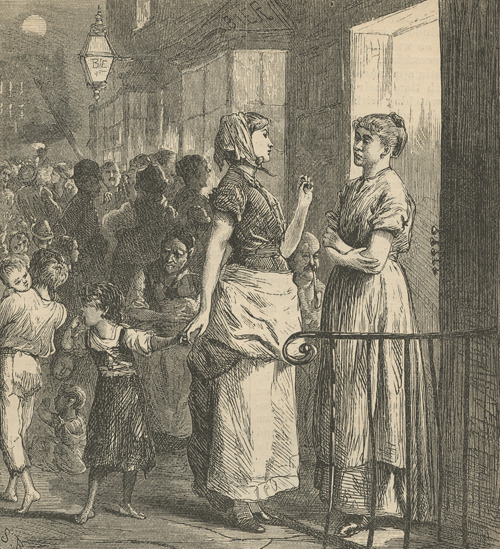 The tenement houses are occupied mainly by the honest laboring population of New York, who receive fair wages for their work. They herd here because the rents of single houses are either out of proportion to, or beyond their means, and because they are convenient to their work. They are not paupers, but they cannot afford the fearful cost of a separate home, and they are forced to resort to this mode of life in order to live with any degree of comfort. Many of the most skilled mechanics, many of the best paid operatives of both sexes, who are earning comfortable wages, are forced to live in these vast barracks, simply because the bare rent of an empty house in a moderately decent neighborhood, is from $1000 upward. Did the city possess some means of rapid transit between its upper and lower extremities, which would prevent the loss of the time now wasted in traversing the length of the island, there can be no doubt that the tenement sections would soon be thinned out. There are two classes of tenement houses in the city. Those occupied by the well-to-do working people, and those which are simply the homes of the poor. The first are immense, but spruce looking structures, and are kept cleaner than the latter, but all suffer from the evils incident to and inseparable from such close packing. Those of the second class are simply dens of vice and misery. In the older quarters of the city, many of the old time residences are now occupied as tenement houses. 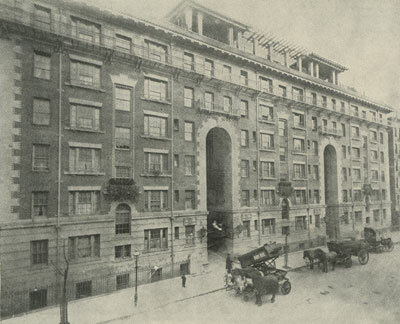 The old Walton mansion in Pearl street, opposite the vast establishment of Harper & Brothers, was once the most elegant and hospitable mansion in New York. 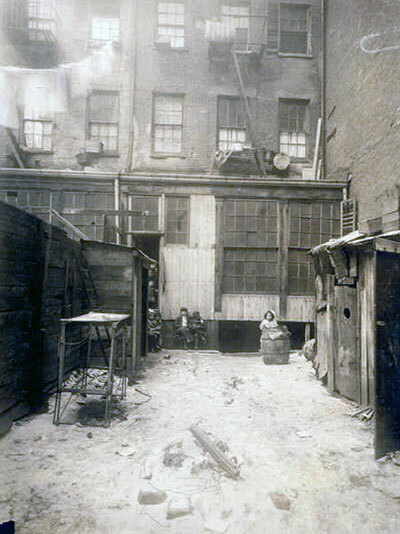 It is now one of the most wretched tenement houses in the city. The tenement houses of the upper wards, however, were constructed for the uses to which they are put. As pecuniary investments they pay well, the rents sometimes yielding as much as thirty per cent. on the investment. One of them shall serve as a description of the average tenement house. The building stands on a lot with a front of 50 feet, and a depth of 250 feet. It has an alley running the whole depth on each side of it. These alley-ways are excavated to the depth of the cellars, arched over, and covered with flag stones, in which, at intervals, are open gratings to give light below; the whole length of which space is occupied by water closets, without doors, and under which are open drains communicating with the street sewers. The building is five stories high, and has a flat roof. The only ventilation is by a window, which opens against a dead wall eight feet distant, and to which rises the vapor from the vault below. There is water on each floor, and gas pipes are laid through the building, so that those who desire it can use gas. The building contains 126 families, or about 700 inhabitants. 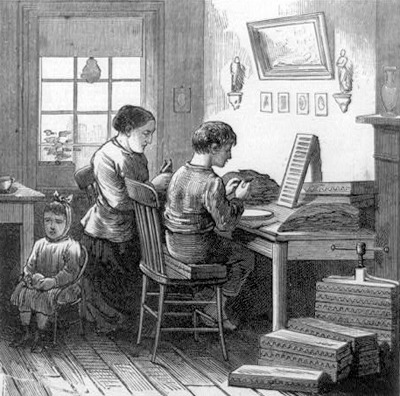 Each family has a narrow sitting-room, which is used also for working and eating, and a closet called a bed room. But few of the rooms are properly ventilated. The sun never shines in at the windows, and if the sky is overcast the rooms are so dark as to need artificial light. The whole house is dirty, and is filled with the mingled odors from the cooking-stoves and the sinks. In the winter the rooms are kept too close by the stoves, and in the summer the natural heat is made tenfold greater by the fires for cooking and washing. Pass these houses on a hot night, and you will see the streets in front of them filled with the occupants, and every window choked up with human heads, all panting and praying for relief and fresh air. Sometimes the families living in the close rooms we have described, take "boarders," who pay a part of the expenses of the "establishment." 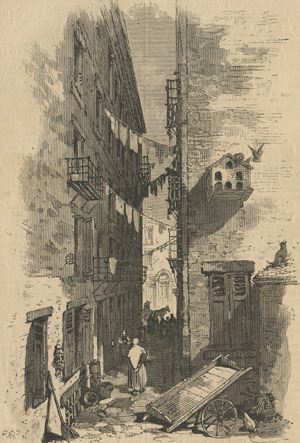 Formerly the occupants of these buildings emptied their filth and refuse matter into the public streets, which in these quarters were simply horrible to behold; but of late years, the police, by compelling a rigid observance of the sanitary laws, have greatly improved the condition of the houses and streets, and consequently the health of the people. During the past winter, however, many of the East side streets have become horribly filthy. The reader must not suppose that the house just described is an exceptional establishment. In the Eleventh and Seventeenth wards whole streets, for many blocks, are lined with similar houses. There are many single blocks of dwellings containing twice the number of families residing on Fifth avenue, on both sides of that street, from Washington Square to the Park, or than a continuous row of dwellings similar to those on Fifth avenue, three or four miles in length. The Fourth ward, covering an area of 83 acres, contains 23,748 inhabitants. The city of Springfield (Massachusetts), contains 26,703 inhabitants. The Eleventh ward, comprising 196 acres, contains more people than the cities of Mobile (Alabama), and Salem (Massachusetts), combined. The Seventh ward, covering 110 acres, contains more inhabitants than the city of Syracuse (New York). The Seventeenth ward, covering 331 acres, contains more inhabitants than the city of Cleveland (Ohio), which is the fifteenth city in the Union in respect of population. The best of the tenement houses are uncomfortable. Where so large a number of people are gathered under the same roof to live as they please, it is impossible to keep the premises clean. A very large portion of them are in bad repair and in equally bad sanitary condition. In 1867 these houses made up fifty-two per cent. of the whole number, and there is no reason to believe that there has been any improvement since then. Many of them are simply appalling. They become more wretched and squalid as the East River and Five Points sections are reached. Cherry, Water, and the neighboring streets, are little better than charnel houses. "As we stopped in Cherry street at the entrance to Gotham Court, and Detective Finn dug a tunnel of light with his bullseye lantern into the foulness and blackness of that smirch on civilization, a score or more of boys who had been congregated at the edge of the court suddenly plunged back into the obscurity, and we heard the splash of their feet in the foul collections of the pavements. 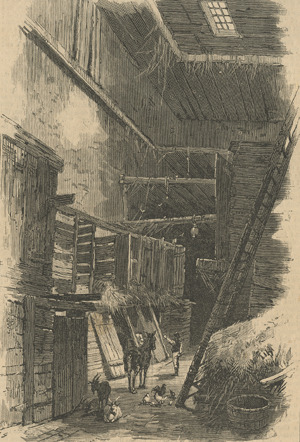 "Carefully keeping in the little track of light cut into the darkness by the lantern, I followed the speaker, who turned into the first door on the right, and I found myself in an entry about four feet by six, with steep, rough, rickety stairs leading upward in the foreground, and their counterparts at the rear giving access to as successful a manufactory of disease and death as any city on earth can show. Coming to the first of these stairs, I was peremptorily halted by the foul stenches rising from below; but Finn, who had reached the bottom, threw back the relentless light upon the descending way and urged me on. Every step oozed with moisture and was covered sole deep with unmentionable filth; but I ventured on, and reaching my conductor, stood in a vault some twelve feet wide and two hundred long, which extended under the whole of West Gotham Court. The walls of rough stone dripped with slimy exudations, while the pavements yielded to the slightest pressure of the feet a suffocating odor compounded of bilge-water and sulphuretted hydrogen. Upon one side of this elongated cave of horrors were ranged a hundred closets, every one of which reeked with this filth, mixed with that slimy moisture which was everywhere as a proof that the waters of the neighboring East River penetrated, and lingered here to foul instead of purify. "'What do you think of this?' said Finn, throwing the light of his lantern hither and thither so that every horror might be dragged from the darkness that all seemed to covet. 'All the thousands living in the barracks must come here, and just think of all the young ones above that never did any harm having to take in this stuff;' and the detective struck out spitefully at the noxious air. As he did so, the gurgling of water at the Cherry street end of the vault caught his ear, and penetrating thither, he peered curiously about. "By this time I began to feel sick and faint in that tainted air, and would have rushed up the stairs if I could have seen them. But Finn was exploring that sewer horror with his lantern. As I came down I had seen a pool of stagnant, green-coated water somewhere near the foot of the stairs, and, being afraid to stir in the thick darkness, was forced to call my guide, and, frankly state the urgent necessity for an immediate return above. The matter-of-fact policeman came up, and cast the liberating light upon the stairs, but rebuked me as I eagerly took in the comparatively purer atmosphere from above. 'You can't stand it five minutes; how do you suppose they do, year in and year out?' 'Even they don't stand it many years, I should think,' was my involuntary reply. "'We'll see whether you would or no,' said Finn, tapping on the door. Being told to come in, he opened it; and on this trivial but dexterous pretext we invaded the sanctity of a home. "Finn was of opinion the bed was hard but healthy, and fixing his eyes on the Buster's flabby face thought it possible he had any desirable number of 'square meals' per day; but that individual limited his acquirements in that way for the day then closed to four. Finn then touching on the number of drinks, the Buster, being driven into conjecture and a corner by the problem, was thrust out of the foreground of our investigations. 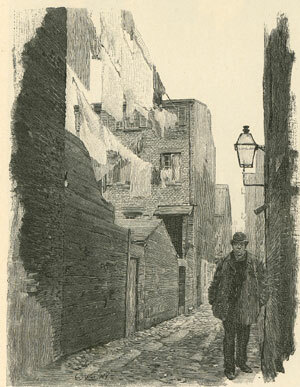 "By various wily tricks of his trade, Detective Finn managed to get a deal of information out of the Pensioner without seeming to be either inquisitive or intrusive, or even without rubbing the coat of his poverty the wrong way. From this source I learned that five dollars per month was paid as rent for these two third-floor rooms, and that everybody concerned deemed them dirt cheap at the price. Light was obtained from kerosene lamps at the expense of the tenant, and water had to be carried from the court below, while all refuse matter not emptied into the court itself, had to be taken to the foul vaults beneath it. The rooms, having all these drawbacks, and being destitute of the commonest appliances for comfort or decency, did not appear to be in the highest degree eligible; yet the Pensioner considered himself fortunate in having secured them. His experience in living must have been very doleful, for he declared that he had seen worse places. In itself, and so far as the landlord was concerned, I doubted him; but I had myself seen fouler places than these two rooms, which had been made so by the tenants. All that cleanliness could do to make the kennel of the Pensioner habitable had been done, and I looked with more respect upon the uncouth woman who had scoured the rough floor white, than I ever had upon a gaudily attired dame sweeping Broadway with her silken trail. The thrift that had so little for its nourishment had not been expended wholly upon the floor, for I noticed that the two children asleep on the shakedown were clean, while the little fellow four years of age, who was apparently prepared for bed as he was entirely naked, but sat as yet upon one of the three chairs, had no speck of dirt upon his fair white skin. A painter should have seen him as he gazed wonderingly upon us, and my respect deepened for the woman who could, spite the hard lines of her rugged life, bring forth and preserve so much of childish symmetry and beauty. "Here was a hero! The narrow limits of his humble home expanded to embrace the brown and kneaded Virginian glades as I saw them just seven years ago, pictured with the lurid pageantry of that stubborn fight when Sedgwick fell. This man, crammed with his family into twelve feet square at the top of Sweeney's Shambles, was once part of that glorious scene. In answer to my test questions he said he belonged to the Thirty-ninth New York, which was attached to the Second Corps, and that he received a pension of $15 per month from the grateful country he had served as payment in full for an arm. It was enough to keep body and soul together, and he could not complain. Nor could I; but I could and did signify to my guide by a nod that I had seen and heard enough, and we went down again into the slimy, reeking court." There is a square on the East side bounded by Houston, Stanton, Pitt, and Willett streets. It contains a group of three front and seven rear houses, and is known as "Rag-pickers' Row." These ten houses contain a total of 106 families, or 452 persons. All these persons are rag-pickers, or more properly chiffonniers, for their business is to pick up every thing saleable they can find in the streets. Formerly they brought their gatherings to this place and assorted them here before taking them to the junk stores to sell them. Now, however, they assort them elsewhere, and their wretched dwellings are as clean as it is possible to keep them. They are generally peaceable and quiet, and their quarrels are commonly referred to the agent in charge of the row, who decides them to their satisfaction. They are very industrious in their callings, and some of them have money in the Savings banks. Nearly all who have children send them to the Mission Schools. 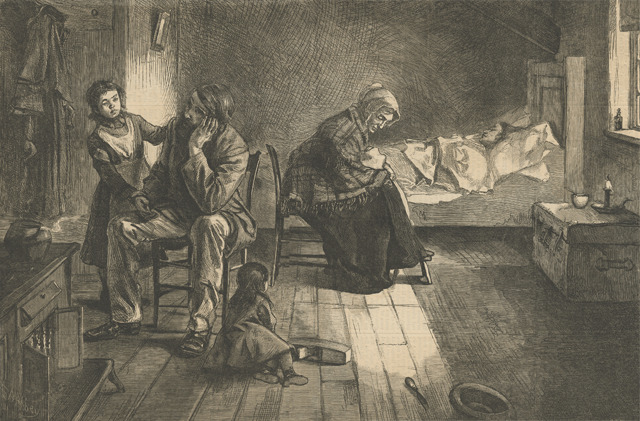 "The worst class of tenement houses was those where a landlord had accommodations for ten families, and these buildings comprise more than half of the tenement houses of the city, and accommodate fully two-thirds of the entire tenement-house population. 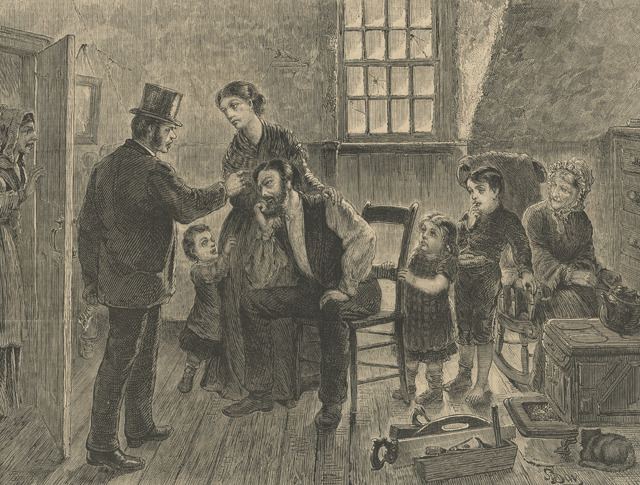 When the number of families living under one owner exceeded ten, it was found that such owner was engaged in the keeping of a tenement-house as a business, and generally as a speculator. It is among this class of owners that nearly all the evils of the tenement-house system are found. The little colony exhibit in their rooms, and in the little areas around their dwellings, extreme want of care. 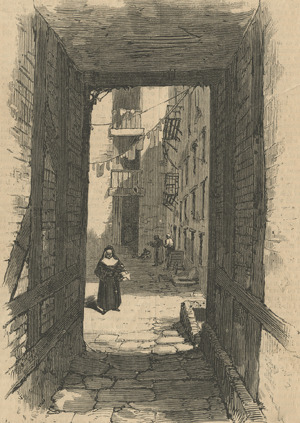 The street in front of the place was reeking with slops and garbage; the alleys and passage ways were foul with excrements; the court was imperfectly paved, wet, and covered with domestic refuse; the privies, located in a close court between the rear and front houses, were dilapidated, and gave out volumes of noisome odors, which filled the whole area, and were diffused through all the rooms opening upon it; and the halls and apartments of the wretched occupants were close, unventilated, and unclean. The complaint was universal among the tenants that they are entirely uncared for, and that the only answer to their request to have the place put in order, by repairs and necessary improvements, was, that they must pay their rent or leave. Inquiry often disclosed the fact that the owner of the property was a wealthy gentleman or lady, either living in an aristocratic part of the city or in a neighboring city, or, as was occasionally found to be the case, in Europe. The property is usually managed entirely by an agent, whose instructions are simple, but emphatic, viz., 'collect the rent in advance, or, failing, eject the occupants.' The profits on this sort of property, so administered, are rarely less than fifteen per cent., and more generally thirty per cent. upon the investment." 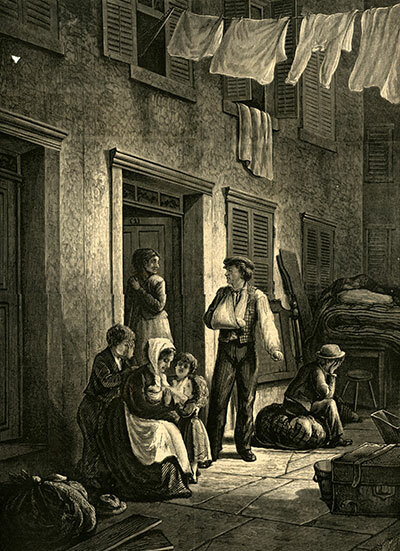 The evils of the tenement house system are almost incalculable. It is the experience of all nations that barrack life is demoralizing, and the tenement house is but a barrack without the rigid discipline of a military establishment. Its inmates know no such thing as privacy. Home is but a word with them. They have habitations, but not homes. Within the same walls are gathered the virtuous and the depraved, the honest laborer and the thief. There can be no such thing as shielding the young from improper outside influences. They have every opportunity to become thoroughly corrupted without leaving the house. Decency is impossible. Families exist in the greatest amount of personal discomfort, and the children take every opportunity to escape from the house into the streets. 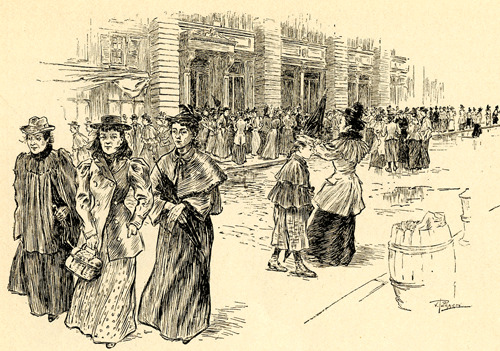 The tenement houses every year send many girls into the ranks of the street walkers, and a greater number of young men into the ranks of the roughs and thieves. Drunkenness is very common among the inhabitants of these houses. Men and women are literally driven into intemperance by the discomfort in which they live. 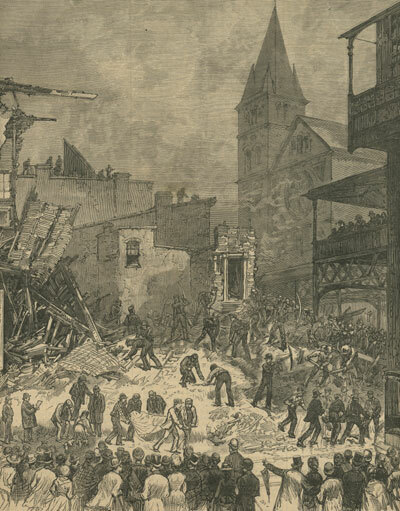 Nearly all the domestic murders occurring in the city are perpetrated in the tenement houses. Immorality is very common. Indeed, the latter crime is the logical result of such dense packing of the sexes. It is a terrible thing to contemplate, but it is a fact that one half of the population of this great city is subjected to the demoralizing influences of these vast barracks. The laboring class, who should constitute the backbone and sinew of the community, are thus degraded to a level with paupers, forced to herd among them, and to adopt a mode of life which is utterly destructive of the characteristics which should distinguish them. It is no wonder that crime is so common in the Metropolis. The real wonder is that it does not defy all restraint. The tenement houses are afflicted with a terrible mortality. Says Dr. Harris, "Consumption and all the inflammatory diseases of the lungs vie with the infectious and other zymotic disorders, in wasting the health and destroying the life of the tenement population." 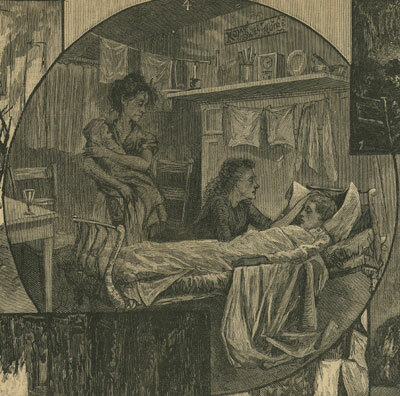 Of late years a new disease, the relapsing fever, which, though rarely fatal, destroys the health and vigor of its victims, has made havoc among the tenement population. The mortality among children is very great, and perhaps this is fortunate for them, for it would seem that death in their first flush of innocence is far better than a life of wretchedness and perhaps of infamy. 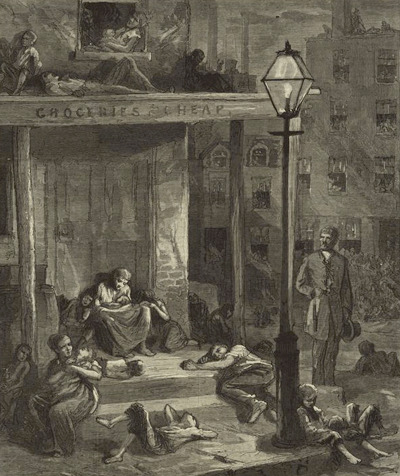 Small pox and all the contagious and infectious diseases would make short work with the tenement-house population, were any of them to become epidemic in the city. There would be nothing to check them, and the unfortunate people living in these sections would find no means of escaping from them. 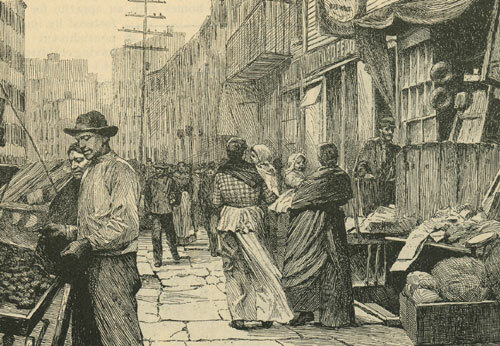 "In front of a Box Factory in Hester Street at Six O'clock"
Street venders generally plied their wares among the poor. 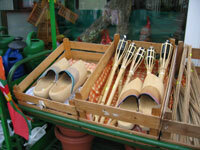 Frequently they were selling produce rejected by the more upscale markets. There was no such thing as a supermarket. The street venders made "the air hideous with their loud, uncouth cries". In the days before Air Conditioning and TV people escaped the hot tenements and took to the streets which were very lively in the evenings. 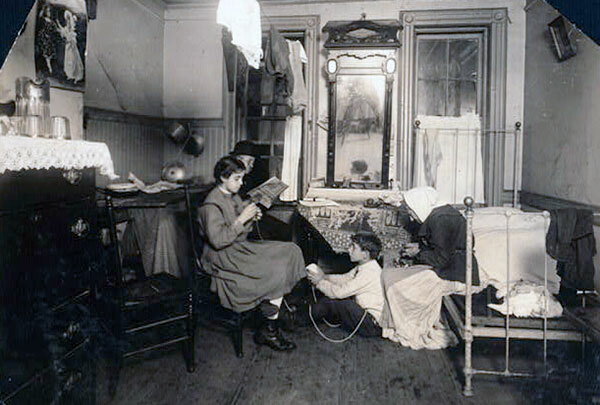 Many tenement dwellers lived and worked in the same Space. Frank Leslie's Illustrated Newspaper, 1877 Nov. 3. Frank Leslie's Illustrated newspaper 10 Dec 1887, collection of Maggie Land Blanck. The New York City Board of Health tried to regulate and inspect milk, cream and other dairy products. A store keeper needed a permit to sell milk. If the conditions of the store were not satisfactory, the permit would be revoked. Concerns included: the adulteration of the milk with such things as water and chalk, bacteria in the milk, other contaminants like dirt and dust. 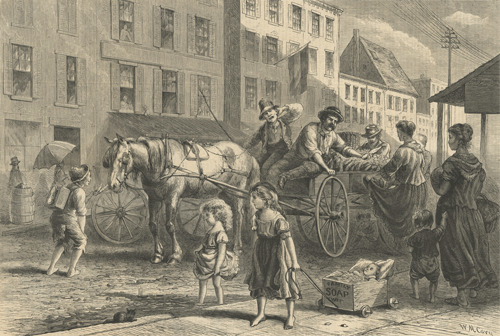 In 1910 there were 13,000 stores and 4,500 wagons selling milk in New York City. Sometimes I buy an image that has been cut from a puplication and the related information is missing. This was the case with the above image. In April 2013 Ian Ellis was kind enough to write and let me know it was from Frank Leslie's Illustrated newspaper 10 Dec 1887. May 1st was a day when many leases, both commercial and residential, expired. Consequently the city was jammed with moving wagons.